The photo above shows the frame created by Mark Passarelli and his team that will be used to hand-form the aluminum body for the W194. Using original drawings and measurements, this will allow for a perfect re-creation. Body panels are hand formed by Passarelli Restoration artists using an English Wheel to fit the panels to the mold. Note that the original 1952 wheels for this automobile, including the dual spare tires, are in place. If it seems like creating the W194 is taking an awfully long time, one of the reasons is the other projects Passarelli Restorations undertakes. At right is Mark Passarelli on August 3rd with a restoration he recently completed for a client in Australia. Mark traveled a number of times to Sydney to finish the restoration that he started in Passarelli Restoration's Arizona shop. You might think that putting the gas tank into the W194 would be a fairly simple process. It's not, and that is evident if you have been following our progress and wondering why it is taking so long. Part of the reason is that the shop has been quite busy with a couple other projects. The other reason is the skill necessary to reconstruct a one-of-a-kind object that is being reconstructed using vintage photos and careful measurements. Mark first created a wood buck, as seen below in the September update. Recently, Hawaiian artisan Shannon Warfield, a skilled metal worker with Psycles Inc., worked with Mark to create the first version of the tank. Back in the shop, Mark and Shannon worked to fine tune the fit. At left, Shannon removes the side panel of the tank to better adjust the fit. At right, Mark and Shannon examine photos of the original W194 to insure accuracy in the reconstructed car. The seats for the car, still in their shipping boxes, were found after a painstaking worldwide search. May - June 2012 Moving Along - Literally! Click on Fullscreen below to see the progress. A running chassis is only weeks away. It's time to put a Tiger in the Tank - the gas tank, not the infamous Tiger Tank. Too soon? Anyway, the photo above shows the buck based on the original gas tank measurements being fitted to the frame. 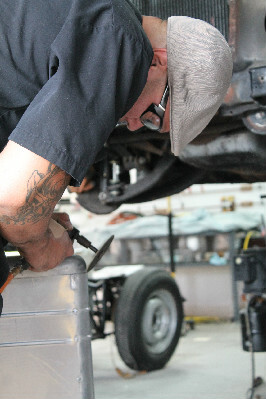 Mark is molding the metal over this buck to insure the fit - exactly as it was done in 1951. We have been getting inquires about why this seems to be taking so long to build. Mercedes had an entire team of more than 20 engineers and fabricators, a factory with essentially unlimited parts, and that great German work ethic. Mark Passarelli has the work ethic (although it is Italian), the skills and the knowledge, and a few people to help. 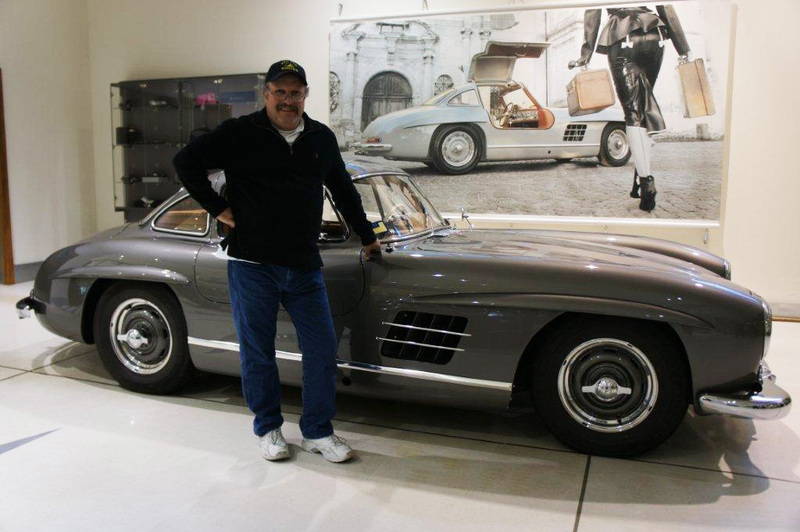 However, after 59 years, the parts are nearly impossible to come by and Mark's team hasn't been building 1950's Mercedes on an assembly line. So, it is taking a bit longer to produce this car, but it will be worth the wait. We want to remind people that next year, 2012, is the 60th anniversary of the creation of the W194 and of its dominance of the racing circuit. Keep your eyes open for an opportunity to see this amazing car in some very select venues! It's not often that you get to be in the presence of automotive history. One of the reasons that the motor hasn't run for more than a few seconds at a time is that there is no gas tank, no oil cooler and, until now, no radiator. These are being fabricated over the next few weeks, carefully fit and painstakingly accurate to the original. Above, the hand-fabricated radiator and oil cooler was installed on August 27th. Next up will be the gas tank, a tricky bit of hand-forming. We hope you aren't getting tired of our saying that Mark and his team - mostly Mark - are making all the components that aren't the factory originals, by hand. Just the way they did in 1951, using the same materials as the Mercedes engineers. It won't be long until we have the video of the running chassis. With the motor running, it is time to get a gas tank and radiator built so it runs for more than a few seconds. Mark has been creating these parts using the English wheel and hand made molds, again designed to the exact 1951 factory specifications. If you fly to the Big Island to visit us, be sure to check out the feature article about Mark and the W194 in the new issue of Hana Hou magazine on Hawaiian Airlines! We have been getting a number of questions about when the W194 will be ready to drive, when the body and interior are going to be finished, and where the car will be shown. Our goal is to have a chassis that can be driven by the fall of this year, 2011. The chassis of this car is without a doubt the most important component. The unique tubular frame is what dictated to the Mercedes engineers in 1951 the need to design the Gullwing body. Mark has been very fortunate, following hundreds of hours of research, to locate the exact Scottish Tartan fabric that was used in the original car. The Hale Merced team is currently at work building the frames for the seats. Again, this is a very labor intensive process that will take a number of weeks. Ideally, the seats will be available for display in the running chassis, although temporary seats will be used through much of the final build and testing to protect the valuable original materials. The body, likewise, will take hundreds of hours for its rough fit over the body mold and then the laborious process of hand finishing each curve to match the original Number One Car. As far as showing the car, we anticipate bringing it to the mainland from our Hawaiian shop in the spring of 2012 as a running chassis. This will give enthusiasts the opportunity to see the real genius of this car, not hidden by its beautifully sculpted body. While it may seem minor, attaching the vintage original equipment shock absorbers (video below) is one more step towards a running W194 chassis. The perfect fit illustrates the care and exactitude that has gone into the reconstruction of the frame that made the W194 such a revolutionary automobile. For over a decade, Mark Passarelli has literally traveled the world to find the original parts for this car, and for more than 25 years he has honed his skills and acquired the knowledge that allow him to re-create this classic. The braking system of the car is also complete. It is interesting to note that this car, the number one car of the 11 W194 cars that were built, has a number of differences from the subsequent 10 cars. Each of these distinctions is present in the reconstruction, from the type of wheels to the engine oil capacity. The motor tests completed, Mark brings the chassis outside for a little Hawaiian sunshine. We anticipate a "drivable" chassis by mid-summer. If you are interested in visiting us and viewing this magnificent piece of automotive history, please contact us. We welcome visitors to our shop in Hawaii, by appointment only please. The photo to the left is the Re-Creation of the original dash from the serial # 0001/52 car showing the correct clock, switches and black horn button (below the fuse box and used only for decorative purpose) found on the first W194. This attention to detail is what separates this remarkable vehicle from any other. The clock used in the Passarelli Restorations reconstruction, like that in the original vehicle, is from an ME 109 WWII German fighter plane. The photo below is the dashboard of the original serial #0001/52 car.